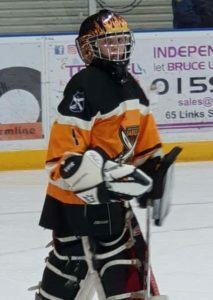 Connie (12) has always wanted to play ice hockey since her Mum took her along to watch the Glasgow Clan play a year ago. She was amazed at how fast the game was and wanted to be able to skate like the players could. 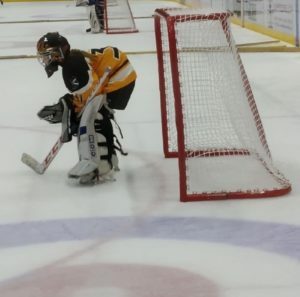 Connie joined North Ayrshire Ice Hockey Club almost a year ago training with the Saturday Learn to Play sessions as a player but changed to goalie position a few months ago and she loves it. She really enjoys the skating drills and learning to move super-fast with lots of heavy kit on to stop the puck. Connie said ‘Ice hockey is a real team sport and it’s great to be part of it. Everybody is supportive and friendly, giving each other lots of advice. The coaches make training lots of fun with lots of games. It is hard work though and I come off the ice happy but tired’. 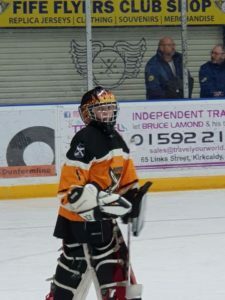 ‘I really enjoy getting trained by some great goalie coaches and I get to attend training sessions with the Scottish Goalie Academy and I am also training with the Scotland Girls Development Team along with Emma L & Emma M, who are also featuring on GMYM! Connie’s favourite moment was when she won Man of the Match in the game against Kirkcaldy.